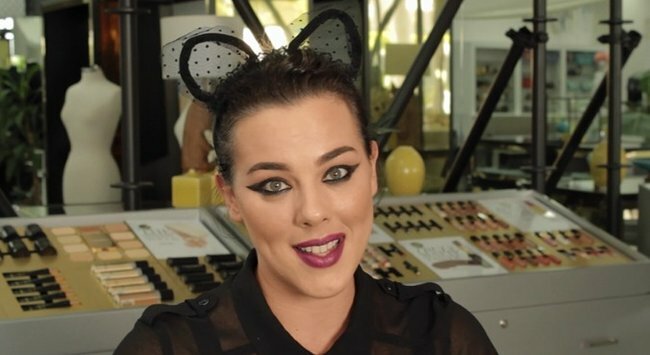 WATCH: Napoleon Perdis easy cat Halloween beauty look. The easiest way to make your everyday look Halloween ready. Whether you love or loathe Halloween, chances are you’re probably doing something to mark the occasion anyway. Whether it’s trick or treating with the kids or attending a party, you’ll be faced with the annual dilemma – what to go as. We teamed up with Tannia Tiropanis from the Napoleon Perdis Creative Team to bring you the easiest way to turn your everyday look Halloween appropriate. (Post continues after gallery. Step 1: Mark your shape by applying tape from the outer corner of the nose up towards the outer corner of the eyes. This will create the shape of your cat eye quickly and easily. Step 2: Apply and blend your shape. Begin to work your eyeliner over the lower lash line, following the direction of the tape applied. Using an angled brush to blend the eyeliner. Remove the tape and begin to work the eyeliner at the outer corner of the eyes till you perfect the shape you are wanting to create. Scribble the eyeliner over the mobile lids and use your fingertips to blend for a smokey finish. Intensify the eye further by lining the waterline with the Kajal. Line the waterline for an intense look. Image: supplied. Step 3: Set your eyes by sweeping setting poweder over them so the eyes become budge proof. Step 4: Finish off with a bold lip. We love Napoleon Perdis&apos; DeVine Goddess Lipstick in Venus ($38) to finish. For more Halloween goodness, have a play with the Napoleon Perdis Halloween Heroes Collection ($59) and check out more ideas on their YouTube channel. What&apos;s your go-to Halloween makeup look?